CI:Now provides data, tools, analysis, and training to inform decisions to improve Texas communities. Our vision is improved lives and decreased disparities through democratized data. We find, collect, link and analyze, and visually display the data that our neighbors need to improve neighborhood and regional conditions. We work to expand people’s access data that is understandable, trustworthy, neutral, and timely. 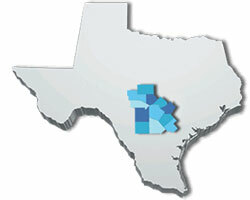 CI:Now primarily serves Bexar (San Antonio ) and 11 surrounding counties (Atascosa, Bandera, Comal, Frio, Gillespie, Guadalupe, Karnes, Kendall, Kerr, Medina, and Wilson) in south-central Texas, near the U.S.-Mexico border. 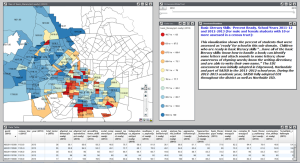 While covering the full 12-county area with county- and zip-code level data, CI:Now works to make small-area (e.g., block group or parcel-level) data accessible wherever those data are available. CI:Now supports both general and focused community information needs. On one track, CI:Now gathers, processes, and engages the broader community around data and stories of perennial and general interest, such as poverty and child immunization rates. On a parallel track, CI:Now responds to the information needs of targeted change-oriented initiatives or topical focus areas. CI:Now is a 501(c)(3) nonprofit staffed and housed through an innovative community-academic partnership with the UTHealth Houston School of Public Health in San Antonio. Learn more about our governance and staffing here. CI:Now became the 35th local partner in the National Neighborhood Indicators Partnership (NNIP) in 2010 and is also a member of the Community Indicators Consortium.